Remove accumulated sediment, construct sediment sump, stabilize/re-vegetate upstream banks with native vegetation and geoweb/geofabric, add pilot channel to direct flows to sediment sump. 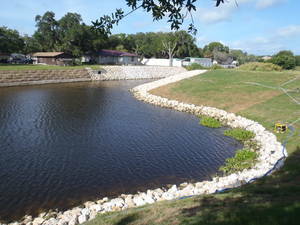 Bank stabilization will reduce erosion and retain sediment, thereby improving flood control conditions. Re-introduction of native vegetation will reduce maintenance requirements. 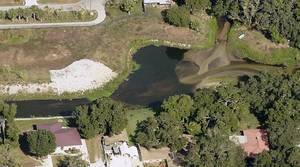 The addition of a sediment sump will reduce flow velocities and promote settling of sediment in an area that will not adversely impact flood control or habitats. Removing accumulated sediments downstream of the bridge will improve flood conveyance.